Maybe you should consider the value of picking up small pots vs. losing medium/big-sized pots, and next time re-raise KK. Why is it that the people who have the most weaselly things to say always do so anonymously? I think it's hard to fault a long-term strategy that sometimes raises with KK from the small blind against a mid-position open-raise, and sometimes just calls. The raise has obvious advantages, but you seem to overlook the advantages of the flat-call. First, ABC poker would prescribe not raising with very many hands in this spot. If one reraises only with the few most premium hands, and does so consistently, that action then means that you're effectively playing with your cards face up for your opponent(s). The call adds deception, because it will tend to look to opponents more like, say, a medium-strength ace or a medium pocket pair. Second, it allows one to see if there is an ace on the flop relatively cheaply before committing a large percentage of one's stack. Third, I believe that this game is $1/2, in which case a huge $20 raise from most typical players is just screaming J-J (or somewhat less often Q-Q or 10-10). 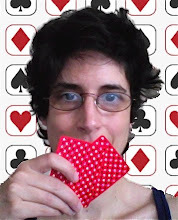 If she knows that her opponent plays that way, then if they get an all-small flop, she has a good chance that her opponent will be willing to stack off, whereas he might well have folded to a big, out-of-position raise from a player as tight-aggressive as Cardgrrl is known to be. If you know only one way to play a situation, Anonymous, your poker thinking is not particularly advanced. Still, I'm sure that Cardgrrl would welcome you at her table so that you can show her the "right" way to play. First of all, I sympathize with the downswing. Lucky poker is fun, the opposite ain't. In general, I agree with the anonymous who made "the most weaselly" comment ;). 'Bet when you are probably ahead,' is a fundamental principle to winning poker.IMO. That said, I agree with Rakewell in that sometimes flat calling with a premium hand can be a decent move. However, I prefer to do it from the button or cutoff not SB, with AA not KK, with a player who I am convinced will predictably bluff with Ace high or a pair of TT. In this case the table clearly was playing extra loosey goosey (J 2). So, I would not get fancy with premium pairs. Cash games aren't static and table conditions weren't really provided. It's hard to give any real kind of advice here. The author of the post is basically admitting that she's letting bad beats affect her play. Unless you're playing very deep and against skilled players you almost never flat KK in the SB. If some stooge is going to raise to $20 with J2 they're probably going to pay off your 3-bet to see a flop, too. Unless you're going against players you see time and time again at a game as low as 1-2 NL there's really never a need to deviate from ABC play since the fish don't know it's ABC play. Basically think back to your first weeks playing poker and think of how many bad calls you made. Yep. That's now them. Happy hunting. KK being beaten by J2 spells one way ticket to tilt.